The Marineland Pro Series Emperor 400 Bio-Wheel Power Filter delivers continuous uninterrupted 3-stage filtration driven by its revolutionary dual impeller design. An easy-load refillable media basket is included for greater chemical filtration. The main impeller drives water directly to and through the mechanical and chemical filtration stages producing a specific amount of gallons per hour depending on the size of filter you choose. The secondary impeller then pressurizes the filtered water through the spray bars powering the extra large bio-wheels. This feature is unique to the Emperor Power Filters. Hang on back HOB power filter for easy installation. Each Filter Includes: Extra large Bio-Wheels (2), Vented Two-Piece Cover, Adjustable Mid-Level Intake, Dual Impeller, refillable Media Container (2), Rite-Size E filter cartridge, Replacement Filter Cartridges (2). This is the second one I've bought. It's quiet, works great, easy to clean, and does a great job. product was shipped on time and was packaged very well I was very pleased with everything and will order from them again. First of all Pet Mountain rocks!! Marine Land Emperor 400 is a great filter. First one I got was very noisy but Marineland Customer Service sent me parts no charge very promptly. If you really want these bio wheels to turn fast use the bio wheel for the 350. It's lighter and really spins. I think it might aerate the water better. This filter is HUGE, but it works great. It took a bit of fiddling to get it adjusted just right to keep it from rattling, but it is now virtually silent and keeps our Koi tank crystal clear. We have a Marineland LED lighted tank hood for our 29 gallon tall aquarium and this filter *just* fit in the pre-scored cut-out area. I've had the filter for about a week now. It's quieter than I was expecting. The bio/chemical filtration is pretty nice and straightforward. Though, I wish it would have come with a little "sample pack" of activated carbon or something to put in the bio containers. I bought the 280 to replace a 400 that had become too noisy. This one was nearly as noisy, but I had a couple extra impellers I had tried in the 400, and one made it quieter. But I noticed the fins on the impeller that came with unit were smaller than the ones I had. The result with the larger fins was a supercharged 280. The impeller makes all the difference. I have a 280 that is very quiet. Had it ten years with the same impeller. I have been in the aquarium hobby for about 40 years. The Emperor power filters are by far the best power filters available hands down in my opinion. This is based upon believing in the effectiveness of the biowheels. The biowheels are what make the Emperor filters so superior. The media baskets make it easy to make your own cartridges, much cheaper than the pre-made cartridges. Water is pumped in a spray bar over the biowheels. This is much better than using the water flowing under the biowheels to turn them. In addition, since the majority of the biological filtration is in the biowheels, you can remove them to clean the unit, thus leaving your bio filtration intact. I do like the original better than the cheapened version now sold. The older version had little plastic windows on the top where you could see if the biowheels were turning. The original also had a flow control lever on the top. Even with the deletion of these two nice features, the Emperor power filters are the best power filters available. The one thing the Emperor and every power filter I am familiar with lack is a UV sterilizer. My preferred set up for a 50 gallon aquarium is an Emperor 400 power filter supplemented by a UV sterilizer. You can get a stand alone UV sterilizer or hook one up in conjunction with a small canister filter. The filter arrived quickly and works as advertised. I read the reviews about excess noise and yes, it is a little noisy upon initial setup. After about 20 minutes you can't hear it from the 2 feet in front of the tank. Can't beat the job it does for the price. Filters are expensive but seem to last quite a while. I would recommend. PROS: Quick-change cartridges are great for mechanical filtration. Biological filtration is done with bio-wheels completely separate from other media. CONS: Great for mechanical filtration. Not good for biological filtration if you have many fish in a large tank because it does not provide enough surface area. BOTTOM LINE: Buy this filter for mechanical filtration only which it is very good at. 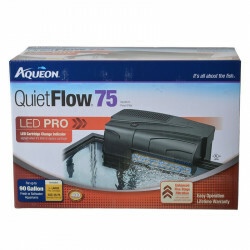 Use an AquaClear power filter for the biological because they have a HUGE media area. After installing the Emperor I saw how crystal clear the water was. All these years with not so perfect water. I too, experienced the problem with the impeller, I thought it was a default. Just a fraction of an inch is design. The trick is after installing sprayer tube to center press down firmly. Of course be on a counter or table. After a few times you just remember when you clean out the whole filter. Now it is super quiet. No more propeller noise. Set up easy and fast! Directions were not perfectly clear, but once understood it set up quickly. It is running quietly and efficiently now. Happy fish, happy fish owners! This is a great filter. I have 2 on my 60 gallon mbuna tank and it is spotless. It was loud at first but when i made sure everything was in place, it was quiet. Great Product! Best Prices and UltraFast Shipping! Purchased pump/filter, heater and replacement filter pads. Will no doubt shop here again! I could not tell the scale of this unit from the website photos. This filter/pump was way too large for my little 6 gallon tank. The water output was quite turbulent and the fish were constantly in a disturbed state. 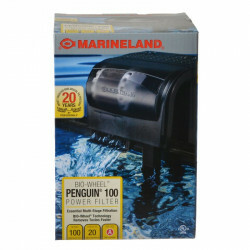 It was also much noisier than the original Marineland filter unit which came with the System Six Aquarium. It cleaned the tank very well however and in short order. Make sure you have a large enough tank before purchasing. We have had our Emperor 280 for 14 years, with very little maintenance. Use it in a 20 gallon tank and still going strong. Keeps tank clean, and makes a small tinkling sound of water moving, but not bothersome. Easy to change filters, and the filter price has remained reasonable. Would recommend. I've had my Emperor 280 on my 45 gallon tank for 3 years now along with a Rena XP1 and love both filters. I originally bought the two different types of filters because I had a huge Oscar and he was very, very messy and very, very destructive. Between the two filters, my water was always very clean (until the Oscar outgrew the tank) and they both put up with the abuse the Oscar physically put them through. There are teeth marks on all of the tubes where the Oscar tried to eat them or at the very least tear them apart!! Now the Oscar has gone to another home and I have a community tank and the pair of filters are keeping the water in even better shape. I've continued to run both filters because I have a tendency to have more fish than I figure either filter is meant to handle individually. Oh, the only reason that I didn't buy the bigger Emperor filter to start with is that the way my tank is built, I don't have room for the bigger filter to hang on the back. I do have the bigger Emperor on a 55 gallon aquarium that I am responsible for at the elementary school I work for and it does a great job on keeping the tank clean. Everyone who comes into the library asks how I manage to keep the aquarium so clean and I have to admit that it isn't me, it's the filter!! I will say that it is much, much easier to change the filter on the Emperor - just pull the old cartridge out and put the rinsed new one in. Sometimes, though, it is difficult to get the new cartridges slid into the slots. This is the best power filter in the market for your price. It has filtration for bio, mechanical and chemical. It has the longest lifespan (I still have my original from 15 years ago). I would choose no other for my prized fish. I set up a 25 gallon aquarium for my granddaughter and topped it with a Emperor 280. Seven years latter, still running strong. I have 2 Emperor 400's on my 58 gallon African Cichlid tank and it always stays crystal clear. I LOVE them. I'm about to order 2 more for my 65 gallon Tropical Community tank now. I know that's overkill, because these filters are designed to do up to 80 gallons each, but I like my water to always be crystal clear and there's no doubt with the Emperor and at the price there's no question. I'm chucking the Fluval on the 65 with that awful priming mechanism! I have the emperor 280 and love it. It is overloaded with the fish I have and I am upgraded and getting a 400. Thinking of using both of them in my new 50 gallon tank. Would recommend this system to everyone. This filter has worked wonderful in my 30g tank! I thought I would need additional filtration, but this does the trick. Quiet too!!! this will be our third emperor. they last a really long time and they work very well! 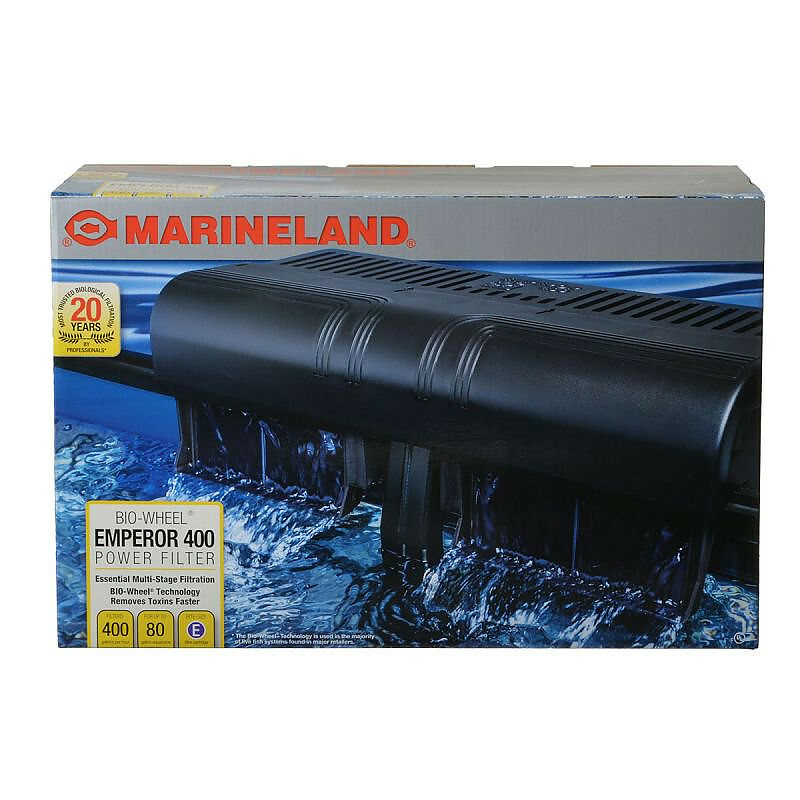 I am getting ready to purchase another Emperor 400 for my marine aquarium. I have owned and used a Emperor 400 and a penguin 350 for over 10 years in my fresh water aquariums and have no complaints. They more than do the job. Best power filter on the market in my opinion. There's not much more to say about Emperor filters. If you research Emp 280's & 400's, you will find thousands of positive reviews. Customizable (inexpensive) media options is what drew me to this unit. Very versatile filtering options for DIY guys. You are not bound to Marineland specific replacement filters. I have two Emp 280's cycling a 60gal. tank. My local pet store has this filter for double the price, also best price on the web. While I've not had my tanks set up for long, I have to say I'm really impressed. The filter has done a great job cleaning my tank and the ammonia levels are low for a new set-up. I was a bit confused at first about which media to use but went with the regular Marineland charcoal. When running it under the tap, it would keep coming out between the plastic vents on the media cartridge. I almost decided to use double filter cartridges but opted to try the charcoal. It did not leak out except for a few grains I quickly scooped up with the net. The filter runs very quiet. It's bio wheel seems to be doing its thing too. Bottom-line, I highly recommend it based on what I've seen thus far. Biowheels are a priority in my purchases of power filter systems, I have 6 tanks running right now for classroom experiments. I go for the Penguin models mostly, unless I'm looking for less noise (see my Rena review). If you really care for your tank, spend a little more for this filter. I have the 280 on my 29 gal. at home. Great aeration system and media container. Size E filters. Beware of its size, do the research on the sizes as these filters are huge. i run these filters on every tank in my house. they are reliable and the bio-wheel is excellent in maintaining proper water parameters! 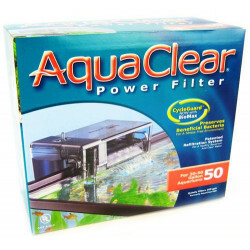 I've only used this type of filters with my fish, they work great. I have these on my 75 gal. and my 150 gal. and have great success.. highly recommended and the price is excellent through pet mntn. also.. thanks! I have 2 Emperor 400 on my 90g tank the water stays Crystal Clear and super quiet. This was the best filter system i have ever owned! Filter works great on a fully stocked exotic goldfish tank. Water always clear and levels are always great. This filter is un-doubtedly the best filter you can buy for aquariums. I have had an Emperor 280 filter running for over 2 years with a single problem. They are built to last. The bio-wheel is a very nice feature that is great for keeping water levels stable in an overcrowded tank or one with messy fish. You cannot go wrong with this filter! I have 4 emperor 400's and 2 280's now and I plan on using more in the future. They are the most efficient filter for the money. The spray bar with the bio-wheel and the double filtration is great.I maintain mine about once a month, and they are easy. Saves time and money. I have owned at least 5 Emperor 400 Power Filters in the last 7 years. They are the best "biological" filter out there. Compared to sponges (that get clogged), sand filters (leach sand), and filter bag media (not enough oxygen). Emperor is even better than bio balls because they do not store nitrates. The "wet/dry" design is super effective in breaking down amonia and nitrite. 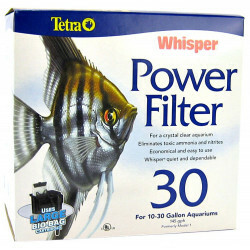 If you have a big bio-load (big fish), this is the most effective filter for you. Put as many Emperors as the back of the tank can hold, (example: 2 Emperor 400 or 1 Emperor 400 and 1 Emperor 280 depending on space you have). The Bio-Wheels do all the work + you do not have to turn power off to change cartridge media.